House of Pinheiro Name Tag Swap #NYlon2014 and Kiddie Adults Unite! The amazing Rachel of House of Pinheiro is hosting a Name Tag Swap for the #NYlon2014 meet up. However, even those who wouldn't be able to make the event are able to participate in the swap, so I eagerly joined! I've admired Rachel's work for a while and was thrilled at a chance to meet some other sewing bloggers and challenge myself in new ways. While I've definitely made use of "Hello my name is..." name tags, I haven't yet made a durable, lasting, fabric nametag before. Besides, it would give me yet another opportunity to use the stamps I carved from art in my sketchbook. See, a couple years ago I caught the carving bug and started drawing these funny cartoony skeletons. I carved a series of them, then made & sold embellished versions of them as pins. I have big dreams for what I will do with carved skelly's, but have had too many other projects in my queue. Original, "One of" Skelly & Eye designs sketched, colored, carved, and embellished, then sold by Gwen Gyldenege at local art events in 2012. Each are pins that have been adopted by art lovers. Before I decided the skelly would be suitable for my swap partner, I did a little research (after she emailed me to let me know we were paired). Vicki of Yellow Submarine Time. I couldn't have been paired with a better person. Vicki is fun, silly, adores + uses her vintage sewing patterns and loves things that most adults would associate with children. For her birthday, she made herself this silly shirt (left) in Sewaholic's Renfrew pattern and loves it because it makes her laugh. This is all especially cool because I use kids patterns (both sewing patterns and fabric) regularly to make my own clothing. My Madd Hattress dress (photo to the right), a costume I made for my one of my milestone birthday parties, which was an Alice in Wonderland Costume Party, was made from a vintage 1940's little girl's dress/jumper pattern. Really, I think of myself as just a big kid. Which is rather appropriate given my wacky humor, "clown school" (Yes I went to "clown school" of a sort. ), My love of puppets and gleeful attitude I fall into when reading to kids. Please do click the "reading to kids" link above to request a story and Pi & I or one of my other puppets will read to you or your kids! We love to read and be silly! 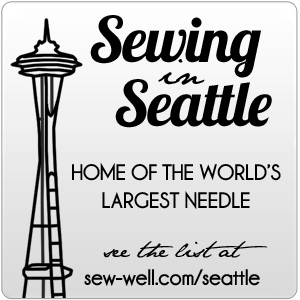 I think that sounds like a sew-along I need to host, don't you? Vicki is amazingly driven when it comes to deadlines. Before I even got started with her nametag, I received mine from her! Isn't this fun?!?! "DID I SAY NO PURPLE DRAGONS????!!! DID I?!?!?!?!?!?" And that is exactly what comes to mind when I see this fun purple dragon on my name tag. Vicki even modeled her design off the awesome vintage 1970's sun rise shirt pattern she got from her mom's stash. Given the name of Vicki's blog and the lovely yellow color of her sewing room (see photo above), I decided to make yellow the prominant color. I also wanted to play with cotton scraps so I cut them into 1.5" squares and quilted them. I've long admired others who have quilted teeny tiny squares and was excited to try. God was that fun. Far from tedious. I loved working that small. I made sure to include the bats because a) they're funny and cartoony and b) bats mean good luck. I began to play around with placement of my "Neener Neener" skelly design. Middle, lower corner, elsewhere... Hmm. You can see on my well loved ironing board (I just can't bring myself to replace that cover even though it's looking rough), that I was playing with all kinds of sizes, carvings, ribbons, etc. In the lower right of the corner on the far right you can see that the original carving I did of "Neener Neener" is nearly the same size as the pre-finished bag. Well, that wouldn't do. I wanted Vicki's name and blog to be more prominent. Hmm... time to move on to other parts while I let the possibilities roll around in my brain. I went on to lining the quilted pocket and then using my new found joy, Soft and Stable, by Annie, I used it for the main body of the bag. What a joy to sew with! Seriously. This gave body and was super easy to sew. I even had to rip the bag seams out and it still handled that well. Color me impressed! This is something I picked up at Sew Expo in February/March of this year. I stumbled on Annie's booth, patterns, bag hardware, etc. and was fascinated. I picked up several patterns and enough soft & stable to make her yoga bag. She all her patterns, kits, and hardware listed on her site which I love because it's easy to get to again, and her finished products are so well organized (it appeals to the engineer in me). I considered making a fold flap on top of the pocket to keep objects in, but it would cover the quilted squares and it would result in fumbling by the wearer. I made the strap really long because it can always be tied short and worn as a necklace or let out really long and worn as a mini purse. I chose to quilt pieces of the straps because that would help tie into the quilted back and top row/band quilting. Plus, doing so helped me continue to use up bits and scraps. I made 2 pockets because it's always nice to separate and organize objects or put your cell phone in a separate pocket so it's protected. I used fabric markers and hand lettered Vicki's name & blog name. Then, after stamping my "neener, neener" skelly design, I embellished her with fabric crayons, pastels, and markers, then heat set it all. When I designed "Neener, neener" I had 2 visions - one of my brother putting all his fingers in his mouth and showing us his full set of chompers, one of my friend's toddler as a kindergarten aged boy being silly, wobbling side to side singing, "neener, neener, neener!" then running away giggling. The perfect energy to pour into an object destined for a Kiddie Adult. Then too, while I sewed, I watched Nanny McPhee Returns. More good, clean kid fun! I must say, if it didn't have Vicki's name on it, I would have had a really hard time letting it leave my possession.